Born in Alabama in 1942, Thompson’s first career was as an attorney. He worked as an assistant U.S. attorney for several years, even serving as minority counsel to the Senate Watergate Committee. During the Watergate hearings, Thompson asked former White House staffer Alexander Butterfield about the existence of listening devices in the Oval Office, which confirmed the existence of said listening devices and eventually proved a major factor in President Nixon’s resignation. Years later, Thompson represented a woman named Marie Rigghianti in Tennessee who was fired from the state’s Parole Board for refusing to release inmates who had bribed the governor. In 1985, the case was adapted into a movie, Marie, with Thompson playing himself. This introduced Thompson to the world of acting, and aside from breaks to serve as a senator starting in 1994 and a presidential run in 2008, Thompson continued acting in films and on TV right up into this year. He appeared in a shocking amount of things for a guy who was also a senator, including The Hunt For Red October, Die Hard 2, Cape Fear, Sinister, The Good Wife, and NBC’s Allegiance. 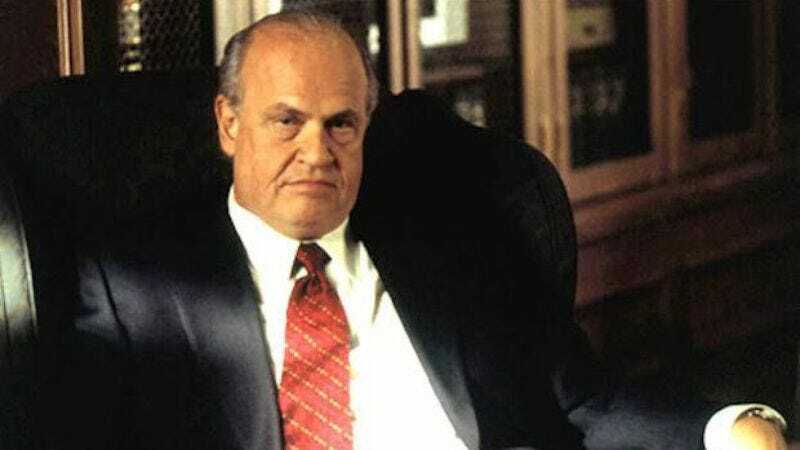 However, his largest role—by far—was that of District Attorney Arthur Branch on Law & Order. He stayed on Law & Order for five seasons, and even popped up multiple times on the Criminal Intent, Trial By Jury, and Special Victims Unit spinoffs. Thompson is survived by his wife, four children, and five grandchildren.